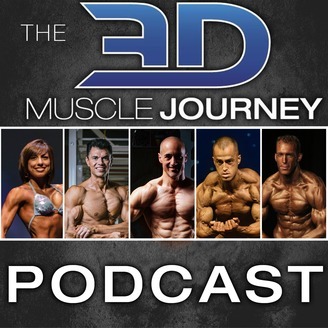 The 5 natural bodybuilding and powerlifting coaches from 3D Muscle Journey come together for conversations dissecting the art and science of muscle and strength. Be a fly on the wall as this collective of coaches discuss the ins and outs of helping athletes reach their potential on the stage, platform and in their personal lives. Dedication. Discipline. Desire. #Team3DMJ. In today s episode, Andrea, Alberto, and Jeff closely examine Jeff s 2019 contest prep. Along with dissecting Jeff s current nutrition, training, and cardio protocols, Jeff elaborates on why he aborted his 2018 contest prep and how his mind-set toward bodybuilding has changed over the last 15 years. What does Jeff consider the pinnacle of his bodybuilding career so far? How has Jeff modified his training to work around injuries? What is Jeff s attitude toward food and hunger this prep? What did he do prior to prep to regain muscle he lost due to injuries? This episode contains insights and anecdotes from the life of Jeff Alberts that any competitor, noncompetitor, or coach can take value from. To get an inside look into the contest prep and life of one of the most experienced natural bodybuilders in the game, check out today s episode. The post #123: Jeff Alberts 2019 Contest Prep Update appeared first on 3D Muscle Journey.